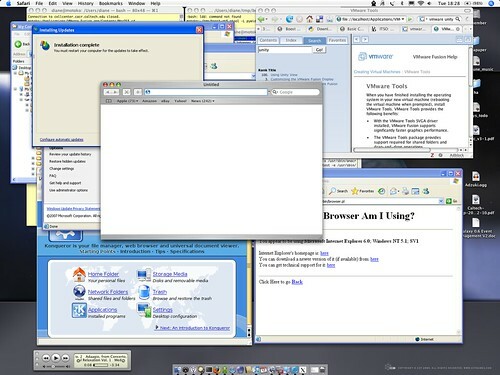 4 browsers from 3 operating systems on one desktop. VMWare is one of the older virtual machine software. Konqueror is just running off of a linux box via X11. That's... LUDICROUS! ;) The most emulation I do is wine for Grim Fandango or dosbox for the old Sierra games. I briefly toyed with the idea of trying to get QBasic working in dosbox, though I haven't followed through (yet). It might be ludicrous, but it could be so much more ludicrous. Sadly the base version of WINE doesn't look like its well supported on OS X. Codeweavers has a separate pay version that they've ported.